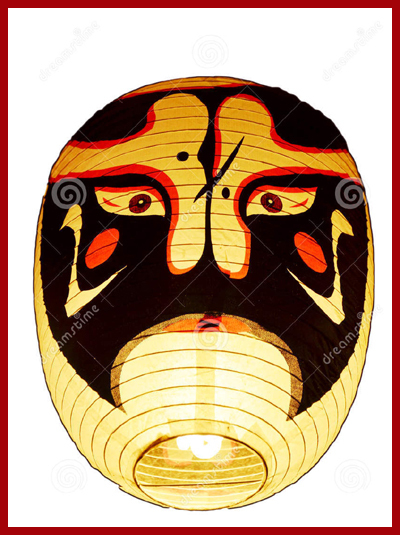 A kind of small andon 行灯　/ 行燈　paper lantern.
. choochin 提灯 paper lanterns . a kind of Japanese paper lamp used in the open. It normally has an hexagonal profile and is used during festivals. It can either hang from a wire or stand on a pole. Famous is the Bonbori Festival (ぼんぼり祭り Bonbori Matsuri), held annually at Tsurugaoka Hachiman-gū in Kamakura, Kanagawa. Artists paint on the about 400 bonbori erected for the occasion on the shrine's grounds. Bonbori festivals are held in many parts of Japan. Bonbori is a Japanese lamp with a paper shade. Various pictures and examples of calligraphy offered to Tsurugaoka Hachimangu are made into shades for the lanterns, which are lined up beautifully along the pathway to the shrine. About 400 lanterns are set up in the precinct for the Bonbori festival. 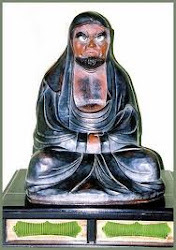 The festival was first held in 1938 with the cooperation of artists and celebrities living in and around Kamakura city. Today, the shrine receives many contributions of drawings from famous people for the making of the lampshades. 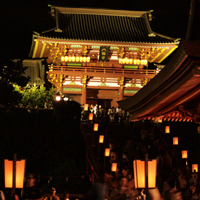 During the Bonbori festival, Bonbori are placed in the precinct, and people can enjoy the masterpieces inscribed on the lanterns, and the fantastic sight of twilight shadow and soft lights after sunset. The candle lights lining the stone paths in the twilight is a much loved scene of summer.
. tai bonbori 鯛ぼんぼり sea bream lantern . They come on wheels, some are quite big and are carried around town. 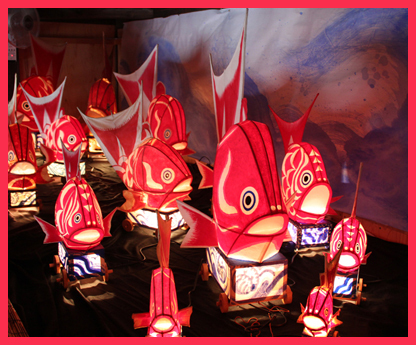 They are a speciality of Murakami town and lighten the night to ward off evil in the summer months. A bit like the Nebuta floats of the Tohoku region.